Founded in Atlanta in 1981, LongHorn Steakhouse purveys good quality at value-conscious prices in a refined, faux-Western atmosphere. 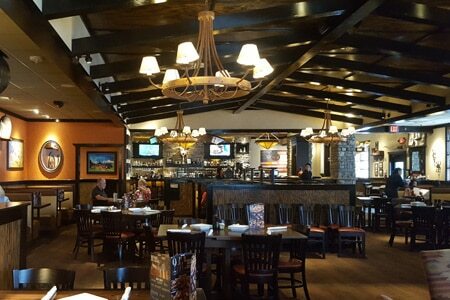 : LongHorn Steakhouse of Toco Hills provides a refined ranch-style, faux Western atmosphere, with wagon-wheel and stag horn chandeliers, lots of Western memorabilia and well-spaced comfortable seating. The Western theme is a bit out of place for a chain founded in Atlanta, but the city likes it. And it likes the good quality food at value-conscious prices. The best meal deal is the lunchtime sirloin, a six-ounce cut with a loaded baked potato for $10.99, although we prefer the salad (a $2.99 upcharge). Larger cuts are available for incremental dollars. Non-meat options include seafood, perhaps grilled, as well as chicken dishes. All mains come with a choice of side and bread. Desserts are standards, but include such popular flavors as a molten chocolate cake. Wine choices are fairly pedestrian, but reds are served too warm. Beer might be a better deal, as some local craft suds are offered. Other locations.